The "Music for Saxophone (E-Flat/Alt) and Orchestra", op. 96b (1993/1995) has the character of an instrumental ballade with rhapsodic elements, in which the soloist takes, so to speak, the role of the narrator. This work in one movement is subdivided into seven sections of contrasting dynamic and rhythmical structure. The piece opens with an eight-part sound, unfolding like a fan, which is re-used several times in the course of the piece to separate sections. A diatonic, lyrical theme in the solo instrument develops to a first climax. The second section is an allegro over rhythmically beating basses, opening into an orchestral tutti. 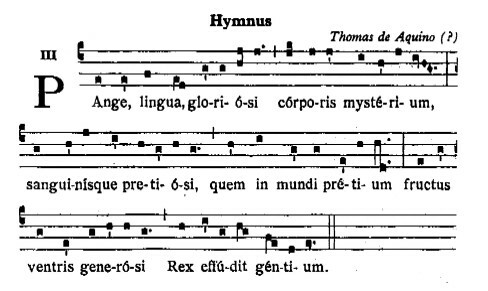 The Gregorian hymn "Pange, lingua, gloriosi" is cited in the third section, to be then combined in a fourth section with the beating allegro of the second. In the next formal section, the complete material of the work - whose beginning is clearly signalled by the abrupt breaking-off of a rising passage - is reworked in a kind of development with short orchestral and solo episodes. A last build-up leads into an expansive cadenza for the soloist, which forms the penultimate section. In the coda, the plainchant motif undergoes jazz-like transformations; then a 16-part chord is built up, out of which the Saxophone emerges with its final musical word - with a B-A-C-H (B-Flat - A - C - B) motif of which hints had previously been audible. A reserved E-Flat chord with a fading upwards glissando closes the work in an extreme pianissimo. In the concert to be given by the Göttingen Symphony Orchestra on Friday coming, the "Music for Saxophone and Orchestra" by Bertold Hummel will receive its German première. Tageblatt sub-editor Michael Schäfer spoke with the composer, who lives in Würzburg. Tageblatt: In your catalogue, the saxophone appears quite often from Opus 68 on. Is there a particular reason for this? Hummel: Indeed there is, for at that point I met a very fine saxophonist from Canada, Normand DesChenes. His playing cleared away my earlier scepticism about this instrument. Later he made a series of CDs of my works. Tageblatt: There was an earlier version of your "Music for Saxophone" for horn and orchestra. What moved you to the reworking? Hummel: I met the saxophonist Andrzej Rzymkowski, who did a lot to promote my saxophone pieces in his native Poland. I rearranged the piece for him. The saxophone version is considerably altered from the horn version, it is significantly more virtuosic and has a completely new cadenza. Andrzej Rzymkowski was also the soloist at the première, which took place on the 9th February, 1996 in Lublin. Tageblatt: In the central section of your piece, you quote, as you mention in your introduction to the work, a Gregorian hymn. Gregorian chant and Saxophone - how does this fit together? Hummel: The sound of the saxophone, particularly in the lower range, resembles the human voice. From that point of view, I can also intone a Gregorian hymn with the saxophone. By the way, Richard Wagner originally wanted to use the saxophone in the "Ring des Nibelungen" - it strengthens in a special way the middle range of the orchestra. Tageblatt: Do you think that listeners from the Protestant north can identify such melodies today? Hummel: Certainly it is not so easy for them as for the Poles - for me it was almost a wonder that they didn't start singing along with the hymn at the première in Lublin. But even if one doesn't know this melody from earliest times, its particular character does come across. Gregorian chant has been for centuries - somewhere deep in the foundations - and still is an integral element of western music. Tageblatt: When you compose, do you think primarily about your audience, or is the musical structure the main concern for you? Concretely: would you sacrifice an idea for a more pleasing sound? Hummel: I would not do that. But for me, however, the triangular relationship composer - performer - listener remains a constant challenge. In this my opinion differs from that of my art-for-art's-sake colleagues, who obviously have not understood their place in the social order. Tageblatt: Do you see a chance of reducing the gulf between the composer and the audience of today? Hummel: The composers must become aware of the role that they have to play. Tageblatt: A personal question: you have six sons. Are there musicians amongst them? Hummel: Five have become professional musicians, one a theologian. And amongst the musicians, two are composers. One writes in a very avant-garde style. Compared to him, Helmut Lachenmann is an "Old Master". Hummel's music appeals to the feelings and is very effective. Some effects are slightly theatrical, but they are always used with a good sense of the total dramatic plan. And all saxophonists can be grateful to Hummel for providing this instrument, often unfairly dismissed as an accoutrement of light entertainment, with such a powerfully expressive concerto in the realm of "serious" music. Saxophonists can at last occasionally play something else in symphony concerts apart from Glasunov.